Traversing tidal waters by small human powered craft has significant risks. Turning the Tide will not be a success unless we all do our part to keep the journey safe and fun. This is not a guided expedition and all participants are personally responsible for their own safety as well as the safety of the group. That being said, Turning the Tide’s organizers will take all reasonable steps to implement procedures that promote safety in order to keep the focus on our message of celebrating the coast and protecting it from tanker traffic. If you are unsure of your ability to confidently participate in this journey please access training from a professional instructor for the type of craft you intend to use. All participants in the People’s Paddle for the Salish Sea must read and understand the information contained in this document, sign an official waiver and follow the directions of designated flotilla leaders. Failure to comply with our safety policy will result in immediate expulsion from the group. The organizers of Turning the Tide acknowledge that open water swimmers as well as power and sail vessels may want to participate in our event. Due to our limited organizational capacity, the scope of our safety planning is restricted to registered participants in the human powered small craft flotilla following the official route. All others are responsible for planning their own safe passage and Turning the Tide will only be able to render assistance in line with a mariner’s normal legal requirements. This also applies to participants who leave the group during the event. Swimmers are strongly encouraged to have an appropriate support vessel with a competent navigator accompanying them. The people’s paddle is organized in “waves” composed of a predetermined ratio of participants to experienced leaders. Wave leaders will follow the overall direction of the flotilla commander (FlotCom). Waves will be numbered, and will respond to group radio hails in numerical order. Participants are responsible for their own safety as well as the safety of their fellow participants. They will ensure that they have the necessary training and equipment required to participate and comply with applicable laws and regulations. If their Wave Leader or the FlotCom determines that a participant’s equipment is not appropriate they will be required to repair or replace their equipment immediately if they want to continue on the journey. Participants will always act in a safe manner, following the direction of Wave Leaders and the Turning the Tide Safety Policy. Any participant who observes an unsafe act or has safety concerns must immediately communicate these with their designated wave leader, or the FlotCom if they are unsatisfied with the wave leader’s response. If a participant decides to leave the group for any reason, they must let their wave leader know beforehand. Those who leave the group are no longer official participants in Turning the Tide and are solely responsible for their own safety. Wave Leaders’ primary responsibility will be to ensure participant safety and make navigational decisions for their wave in accordance with the FlotCom’s direction and the International Rules for the Prevention of Collisions at Sea, Canadian laws and regulations covering marine safety and their own good judgment. Each Wave Leader will have the authority to suspend travel and expel individual participants who endanger the group. Leaders will hold current guide or instructor certification or have extensive equivalent experience as well as Wilderness First Aid certification. Leaders will carry marine VHF radio and monitor the designated flotilla hailing channel. In the event of an emergency, leaders will notify the FlotCom and provide immediate response and rescue under the FlotCom’s direction. The FlotCom will have the ultimate authority for route planning, centralized communications, emergency management and daily decisions to commence and suspend travel. In the event of an emergency the FlotCom will co-ordinate the response and manage communications both within the flotilla and with outside rescue resources. The FlotCom will inform Coast Guard traffic and nearby vessels of our movements via VHF radio. Wave Leaders and the FlotCom will use Industry Canada standard Marine Radio procedures. Leaders are asked to keep their communications to the minimum required for safe operations. All communications to vessels and authorities outside the flotilla will be routed through the FlotCom except for circumstances of a direct and imminent threat to life and property (mayday, pan pan calls). All participants agree to refrain from the use of drugs or alcohol while on the water. If a participant becomes impaired through fatigue, a medical condition, etc. they must inform their Wave Leader and return to shore if needed. Any participant who recklessly endangers themselves or the group will be immediately expelled from Turning the Tide. Due to the inherent issues with evacuation for medical care, you are required to disclose known medical conditions on your signed Consent Agreement. All consent agreements are considered personal information and will be stored and viewed as per the Personal Information Protection and Electronic Documents Act. The FlotCom, Turning the Tide registrars, your Wave Leaders, and First Aid/EMS personnel will be the only viewers of your Consent Agreement. There will be advanced first aid available during the paddle portion of the event should the need arise. BC Ambulance services are available on Salt Spring and Pender Islands. The activity and waters within which we will be paddling are not without risk. We will mitigate known risks to the best of our ability, however you must have the requisite skills to safely paddle these waters in a group. Self-rescue, rolling a kayak, wet exit, re-entry skills, swim/tread water, appropriate physical endurance (longest day will have ~ 4.5 hours of paddling) are all skills/abilities that are required to safely participate. If a participant is unable or unwilling to safely paddle with the group, Flotcom reserves the right to advise the participant that they will be accompanied to the nearest safe harbour to proceed to the next camping location or home via the ferry system. A serviceable vessel (kayak, canoe, or similar) that will pass a Canadian Coast Guard safety inspection, proper PFD or life jacket worn correctly, a bailer, a spare paddle, a whistle, appropriate clothing for July weather in the Salish Sea, and appropriate camping gear are all requirements that can be seen on our gear checklist. In the event that the wind direction/speed, sea state, visibility, marine vessel traffic level(s) exceed thresholds for safe operations the FlotCom will hail all Turning the Tide Wave Leaders and inform them of his/her decision to suspend operations and order waves to travel to the nearest predetermined safe harbour. Wave leaders will acknowledge the communication in numerical order and immediately proceed to harbour. Wave leader will inform FlotCom of the incident and commence rescue. FlotCom will respond to the location as soon as possible to perform first aid and transport casualty to shore and medical attention. If necessary FlotCom will issue a “mayday” to request Coast Guard/other assistance. FlotCom or Wave Leader will immediately hail danger vessel (VHF 16) and Wave Leaders will initiate evasive action for their wave. If there is no response from vessel nearest Wave Leader will sound 6 short blasts with their air horn. 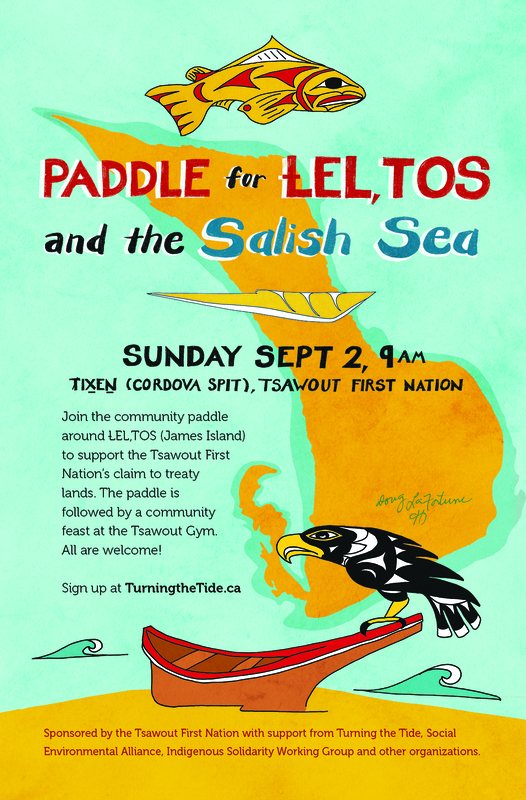 Safety is the paramount consideration for the Turning the Tide paddle and community gathering. Your effort familiarizing yourself with the policy, and complying with its provisions, are essential and appreciated in contributing toward a successful event.